It was so wonderful to meet you at school the other day! I'm not able to visit every school in the world, so it was extra-special to me that I was able to stop by yours. I am so proud of you and all your classmates! I could tell that you are eager learners. Your teacher mentioned how impressed she is with all of you. I must say, not all little boys and girls behave so well during the excitement of my visit. Thanks for letting me know what you want for Christmas! It makes everything go so much more smoothly when I'm able to get the orders in to my elves early. Boy, is that sleigh going to be full! Remember to get plenty of sleep on Christmas Eve. 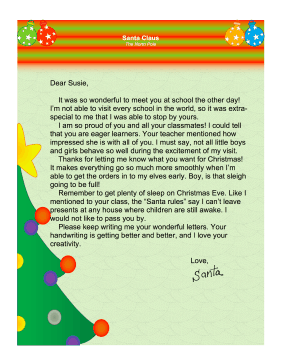 Like I mentioned to your class, the "Santa rules" say I can't leave presents at any house where children are still awake. I would not like to pass you by. Please keep writing me your wonderful letters. Your handwriting is getting better and better, and I love your creativity.